After altering his own past Barry enjoys the life he always wanted, with his parents alive and well and another Flash on the job. But when a speedster calling himself the Rival terrorizes Central City, Barry is pressed back into service — and soon finds that the life he had before is slipping away forever. WHAT WOULD YOU SACRIFICE TO HAVE EVERYTHING YOU'VE EVER WANTED? Barry (Grant Gustin) is living his dream life -- his parents are alive, he's asked Iris West (Candice Patton) on a date and he can finally be a normal guy as Central City has another speedster, Kid Flash (Keiynan Lonsdale), running around saving the city. 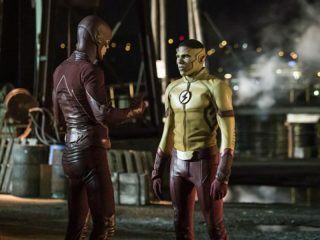 When Barry starts forgetting parts of his old life, the Reverse Flash (guest star Matt Letscher) taunts his nemesis and tells him that there will be serious repercussions for Barry and the ones he loves if he continues to live in this alternate universe. In addition to losing his memories, his powers will also start to fade. When disaster strikes, Barry must decide if he wants to continue to live in this world as Barry Allen or return to his universe as The Flash.